THE Ninja! Kawasaki GPz900R. Landmark Badassery! George Orwell predicted that in 1984 life for the common man would be very different and how right he was, well certainly if back then, you were a biker. In that year Kawasaki regained their reputation as the maker of the very best and exciting sport bikes with the GPz 900R, with this machine they had skillfully combined all that was demanded in modern motorcycling like comfort, fine handling and ease of use and yet somehow still created an unsanitized, fast and furious bike that appealed to petrol heads the world over. 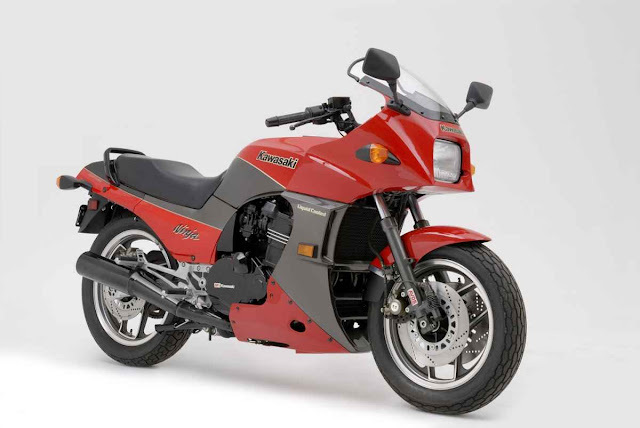 Following on from a strong Kawasaki tradition and in keeping with most big machines of the period the power of the engine is only just held back by the chassis but hold it the “Diamond” frame does and the ride is excellent. 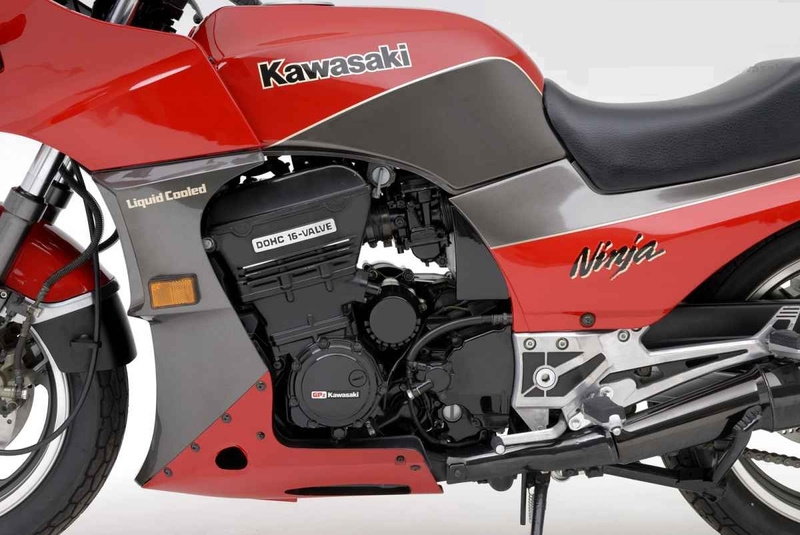 Ground clearance is superb and another area where the GPz900R Ninja set a new precedent, the engine although low slung in the frame is a mere 15” wide at the cylinder blocks, compare that with the GS1000 at 17”, and is an exercise in space saving design. Mounting the cam chain at the very left hand end of the row of cylinders instead of in the middle negates the need for extra metal either side to separate the chain run from the inner cylinders and the result is that another few millimetres of barrel width have been shaved off. Placing the water-cooled cylinder liners very close to each other in the block and employing the wet liner technique that sees the coolant running directly against the metal of the cylinder gave further reductions in width. 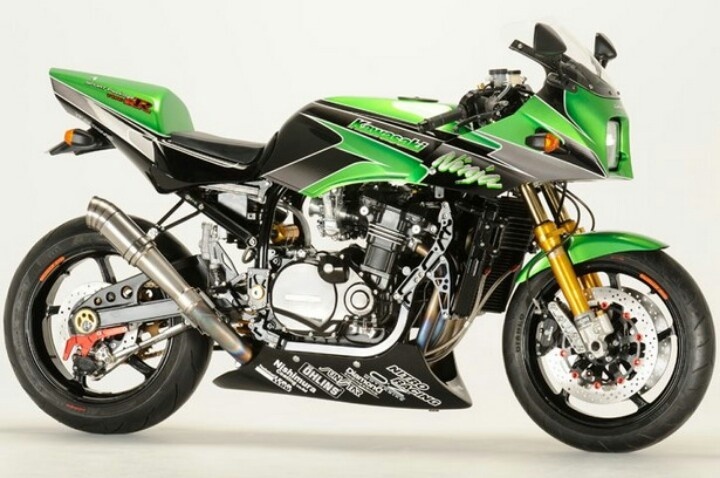 This slimming exercise is further achieved by slinging the usual bits that hang off the end of the crankshaft up behind the cylinder block leaving the crank ends blank, the Kawasaki GPz900R measures 17.75 inches around its girth while the GS1000 stacks up a whopping 22.5 inches. Even the four 34mm carburetors are angled in once they leave the cylinders to meet with a very narrow air box once again adding to the lithe feel that the rider enjoys. The only give away as to the size of the bike came with a rather heavy feel to the throttle but even this was removed in 1986 when the single pull cable and its hefty return spring was replaced by a lighter feeling, push pull, two cable set up. 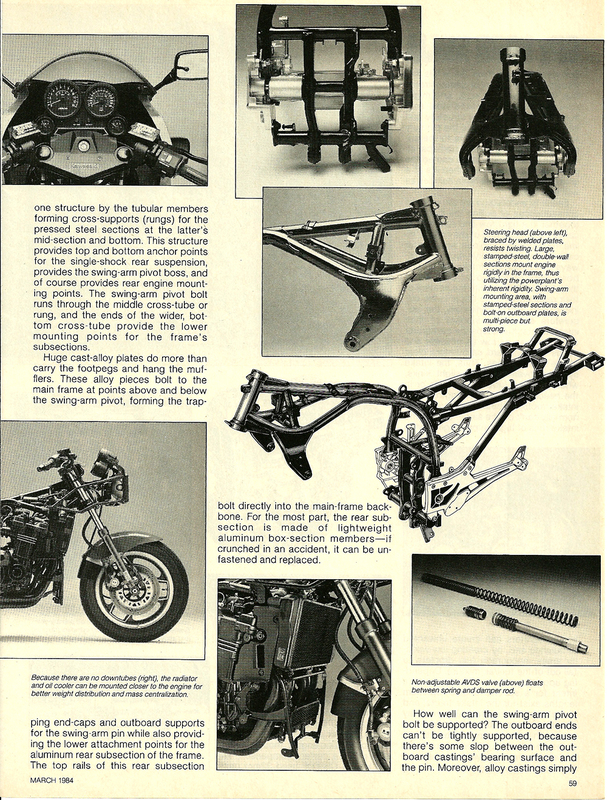 The exotically named “Diamond” frame was little more than a tubular steel cradle with no down tubes, instead it relied heavily upon the engine for its strength enabling the power plant to sit lower in the chassis for good balance. Chassis wise, on paper at least the GPz’s frame is not what the early eighties Superbike should be wrapped in, pressed steel parts are welded to steel tubing components to form, when viewed in isolation, a springy looking piece of metal that in effect serves little purpose other than joining the forks to the swinging arm, the engine slots in the middle and becomes the part that stops these bits from moving around. 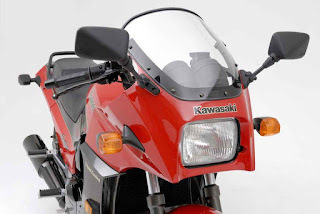 Inline, 180 degree crankshaft, fours inherently have a vertical vibration problem that cannot easily be solved, Kawasaki however did exactly that by hanging a balance shaft just behind the crankshaft. This smoothed out the engines best attempts at shaking itself out of the frame and resulted in the minimum of metalwork being required to attach each end of the cycle parts to the power plant. 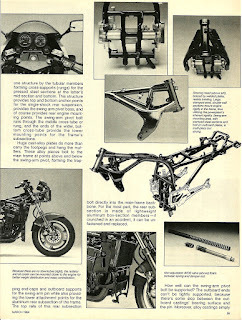 While the others were busy rubber mounting their engines to make them bearable Kawasaki were making theirs into viable and space saving frame components. The forks with a lengthy 140mm of travel and a further 115mm from the rear the ride is certainly a smooth, yet well controlled one, add into the equation the sumptuously padded seat and you could ride fast on this bike all day, which is exactly what endeared the design to the legions of fans over the two decades the type has been in production. The square section aluminium swing arm is controlled by the single “Uni-trak” rising rate suspension set up that with its air and oil damped shock adjustable for compression damping and spring rate adequately keeping the tyre in contact with the tarmac. The loads from the shock are transmitted through the main part of the rear frame doubling as both the swing arm and the rear shock mount. This robust piece of steel that runs up the centre of the frame does a great job of soaking up any bumps and holding the plot straight and true, to add further strength to the rear end, the huge aluminium footrest plates also play host to the swing arm bolt. 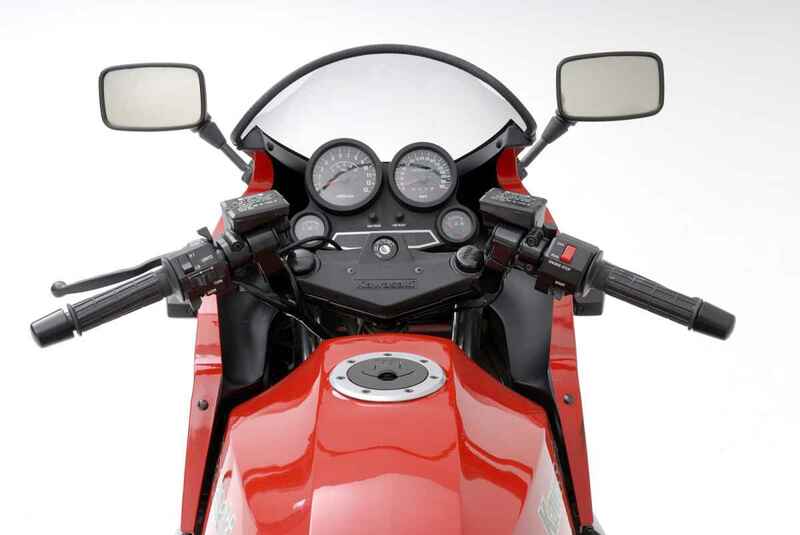 What at first sight appears to be a large, lardy and heavyweight machine the GPz900R literally comes alive when the needles head to the right hand side of both clocks. This is a machine that, as if by magic, once moving, sheds a huge chunk of the 502 lbs to feel like a sprightly 750 and yet performs more like an 1100. 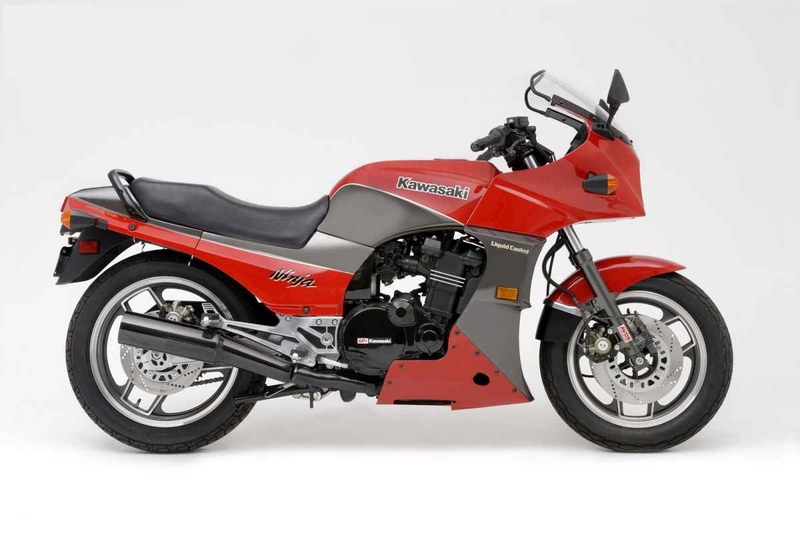 The low-slung engine is positioned perfectly, enabling the bike to be slung around and manhandled around the twisty bits making the GPz an instant hit with the production racers of 1985. The riding position is a well judged compromise between full on, head down, bum up racer stuff and a more relaxed touring stance, very much like the Honda VFR series from a few years later, and it works well giving the rider plenty of leverage over the bars and comfortably placed footrests that enables the GPz to hustle around bends in great style. Although there is plenty of pulling power low down in the rev range hit the six mark on the tacho and things start to get serious with a wide spread of torque and horsepower all the way on up to the redline situated at 10,500 rpm. The silky smooth engine powers away from low speed turns just as capably as it does the highspeed stuff. 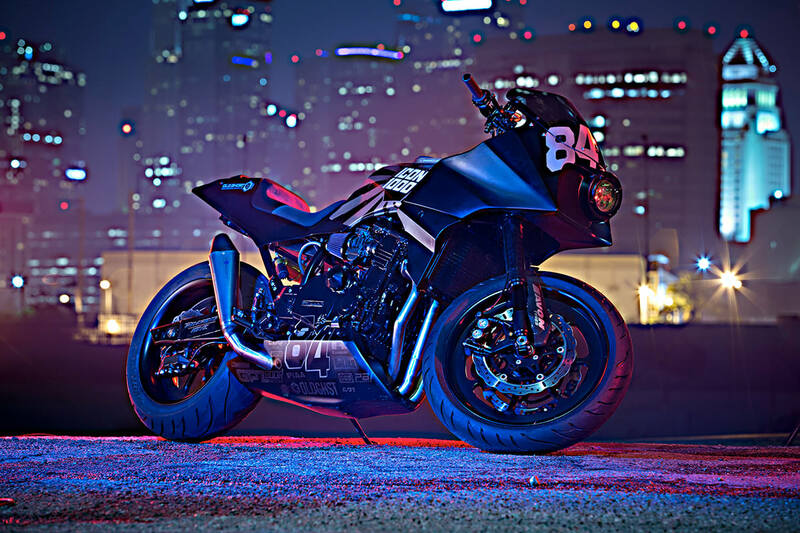 The engine is revvy and most willing to join you in some tarmac based fun, each gear ratio is perfectly chosen for the power delivery providing exactly the right amount of drop in revs between each selection and pushing the Kwak onto its 155mph top speed. Despite producing less power than its predecessor the GPz1100, the relative baby of the family outstrips the big air-cooled four in the speed stakes thanks to the cleverly designed fairing which once tucked in behind makes the GPz into very slippery beast indeed. The sixteen inch front wheel can be a lethargic and lazy feeling piece of equipment but on the GPz it feels as flighty as any other size of tyre and the large contact patch provided by the rubber doesn’t overwhelm the rest of the chassis making the Ninja one of the better handling machines of the period. On the brakes the anti dive is surprisingly good, so many systems of the era just kick in to fast and too hard leaving you with a solid front end and little feel from the tyre, the Kawasaki design is more subtle than that and becomes a useful addition to the Ninja’s armory. 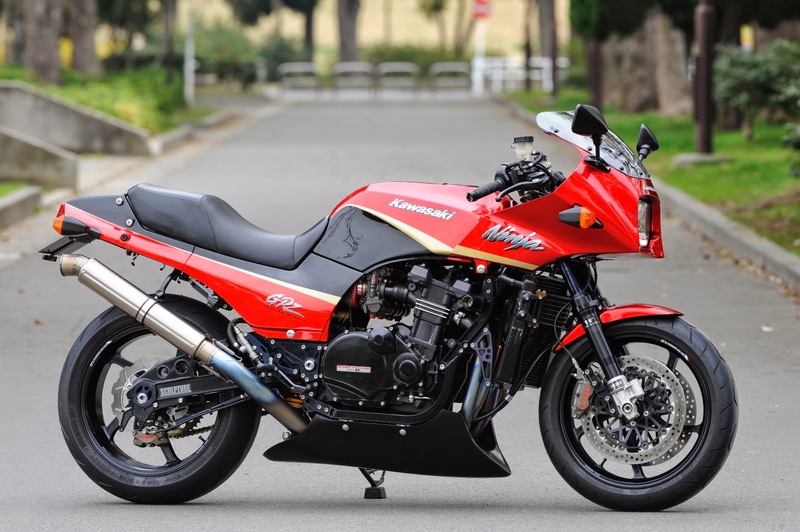 Over the years the type has proved itself capable of wearing many hats as once the performance had been surpassed and it was forced out of the Superbike class the design was renamed as a sports tourer and with good reason. It can mile much with the best of them, the very first model came equipped with handy luggage hooks tucked away under the seat, while the large tank and good fuel consumption means you wont be stopping too many times on route. It wasn’t the first water cooled four or even the first inline water-cooled four as a few other machines had been around with those attributes earlier but what the GPz can claim to be is the first such machine that could lay claim to the crown, king of the Superbikes. 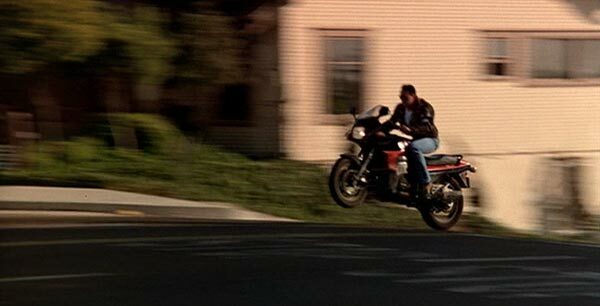 The Kawasaki GPz900R could have slipped onto the worlds stage unnoticed had it not been so good. The opposition, Yamaha, Suzuki and Honda in particular, were working hard to stamp their authority upon the history of motorcycling and on the face of it were doing a pretty good job with high performing, large capacity four cylinder machines. Kawasaki still had some tricks up their sleeve and many innovations were included in their latest flagship machine. 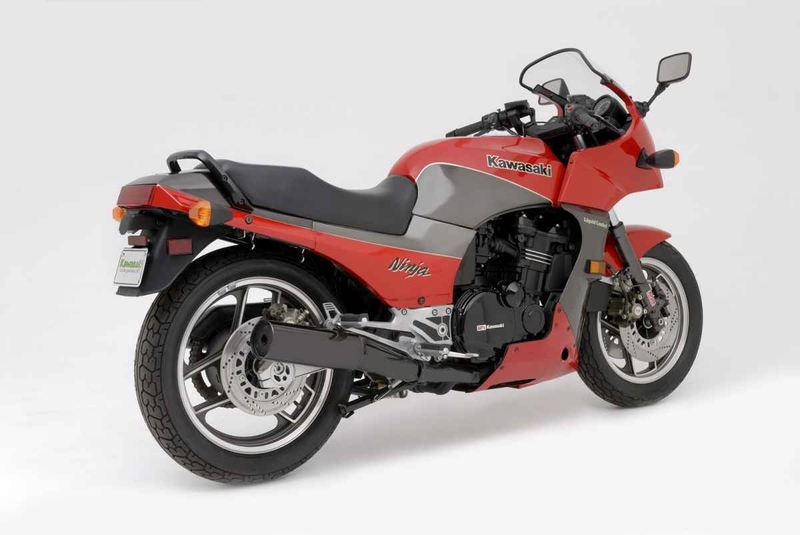 There is no doubting the charisma exuded by the GPz900R, twenty-one years after its first appearance on the world’s stage the bike still turns heads and attracts attention whenever they make a public appearance. Did the Ninja have any real opponents? Well in reality, until a year or so had passed and the others caught up, nothing came near. The big Honda V-four looked a likely candidate for toppling the king off his throne, but in reality it was heavy cumbersome and fraught with problems. The big Honda was great for long straight roads but never endeared itself to the back road scratching quite like the Kawasaki GPz900R did. 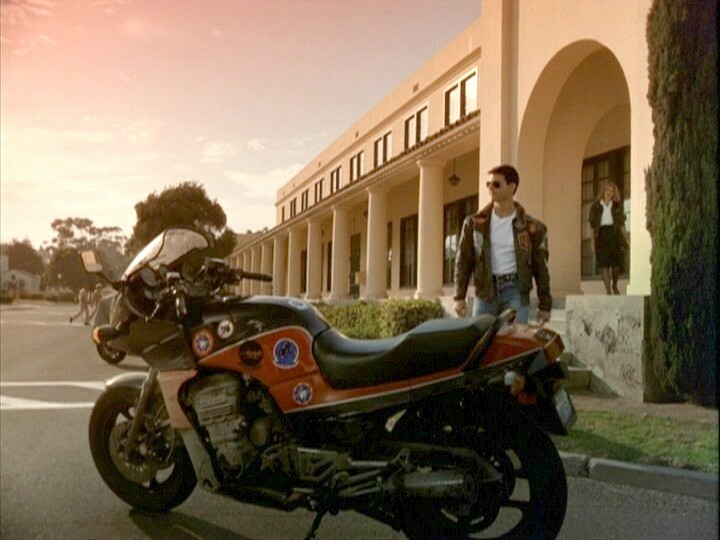 The FJ Yamaha was a similar animal at least on paper but on the road it quickly ran out of both grunt and ground clearance, often the latter before the former. The Gpz900 laid the foundation stones for the rest of the Superbike monument to be built upon and the DNA can be seen in today’s Hypersports tackle, the mighty Honda have long since given up on the V4 format for its sports roadsters, consigning that idea to its touring division and joined the ranks of the inline four liquid cooled, multi valve screamers. The simple across the frame power plant, and competent chassis of the Kwak, won it many friends and more than a few races to boot. The Gixers were just around the corner, as indeed was the Yamaha FZR series and the whole Superbike era was about to kick in for real. 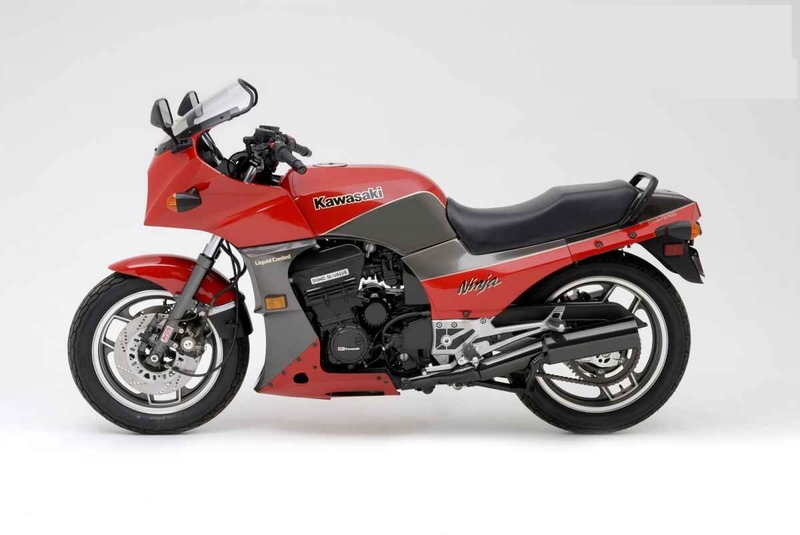 None of the machines that followed out lived the basic GPz900R concept, in fact even Kawasaki’s own attempts at updating the design with the GPz1000RX and the ZX-10 didn’t see off the 900, as production of the type ran on well into the 90’s with the final UK model the A9 ending production in 96. So the answer is no, the Ninja had no opponents worth their salt in 1984, it was devastatingly effective. With such an amount of easy to use power on tap, few people would consider liberating more from the GPz however there are various stages of Dynojet kit, from stage 1 to stage 3, available to get a little more out of the big four. The engine in standard form is more than enough for most people but should you desire the Kwak to drink more gas on its way to potentially higher speeds then the parts are there to enable you to do it. Just remember the chassis is just about on the limits of the 113bhp or so already produced so any major gains will no doubt highlight deficiencies in other areas that had previously been trouble free. After market filters and exhaust pipes can release a few more horses from the Kawasaki motor but at the expense of some drivability and reliability. Tinker away to your hearts content by all means but once the Dynojet kits and filters have been added and set up it would be hard to improve further on the basic machines capabilities. 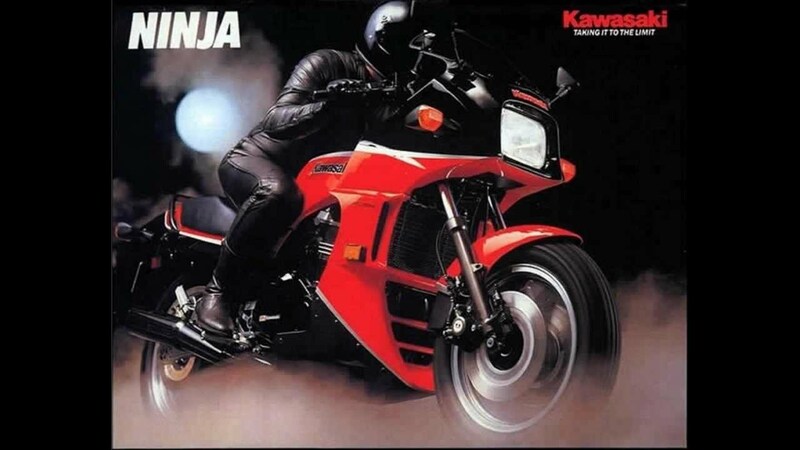 1984 Kawasaki GPz900R, Fighting With the First Ninja!